Coming out of the performance studio in Gilmorehill Halls I had to go for a long walk to let my thoughts and feelings settle. The play Letch fulfilled the expected gore of the horror genre, but went deep to the bones as it did not only scare and disgust, but left me with many thoughts and emotions to process. I saw the play, written and directed by two Glasgow University students, not knowing that it was a reimagining of The Crime in the Madhouse by Grand Guignol. Letch is a play about the internal insanity of Louise’s mind. Four actresses played the roles of Louise, the monsters Letch and One-Eye, and the Priest. The Priest was the only character who could step out of the white tape markings defining the stage. The Priest was not confined in a cell, as the end revealed that Louise was. More importantly however, she was also the only of the four not trapped inside Louise’s mind. The white tape square on the black floor of the performance studio was on the same level as the audience, sitting in rows on one side on the same level. Throughout the play, the protagonist, Louise, did not leave the stage, and it became increasingly clear that she was trapped there and wanted to escape. The stage simultaneously was a performance space, a cell of confinement for Louise, and Louise’s own mind, from which she could not escape. This made it unclear where the stage, and therefore the play’s narrative, actually ends. The ambiguity of the plot builds a tension which is only released in the very last moments of the play. It did not worsen it, in fact it strengthened the play’s overall effect that the ending was not clear. I left the studio trying to put together whether Louise killed herself, the priest, or whether the priest killed Louise. It was effectively confusing, gross, and horrible. 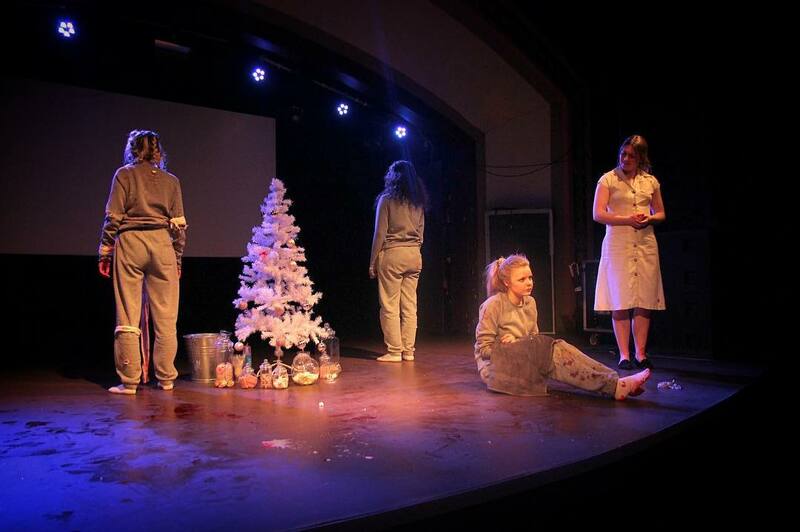 The audience sat close to and on the same level as the four actresses, which created an uncomfortable closeness to the gory and horrifying displays of torturous pulling out of eyes and noisy devouring of vomit. Sign systems such as the lighting and sound came together with excellent costume and prop usage to engage the audience to the point that I saw some people gagging. Letch is the kind of play that is so dark, heavy, and engrossing, that it is not fun to watch. It is a great art work, excellently written, acted, and put together with props, lighting and sound. I give it a 5/5 and hope that everyone involved will continue to create great (or horrible) performances! In association with the Big Puppet Theatre Co.